This article shows how to display Elasticsearch Watcher events in an Angular UI using SignalR. The Elasticsearch Watcher events are sent to a MVC 6 controller in an ASP.NET Core 1.0 application. The action method in the controller handles the watcher events and sends the data to the Angular UI using SignalR and the SignalR client library angular-signalr-hub. Here’s the configuration for the ASP.NET 5 project using the beta5 version. Now SignalR can be added to the Startup.cs class. This just requires the AddSignalR and the UseSignalR methods in the ConfigureServices and Configure methods respectively. Now that SignalR is up and running on the server, a Hub can be created and used. The Hub in this demo is a simple class which inherits from the Hub class. In the MVC 6 controller, WatcherEventsController which is used to handle the Elasticsearch Watcher events, the AlarmsHub is used to send the events to all the SignalR clients. The Hub is added to the controller using the FromServices attribute. Then the client can be used in the WatcherEvents/CriticalAlarm method. 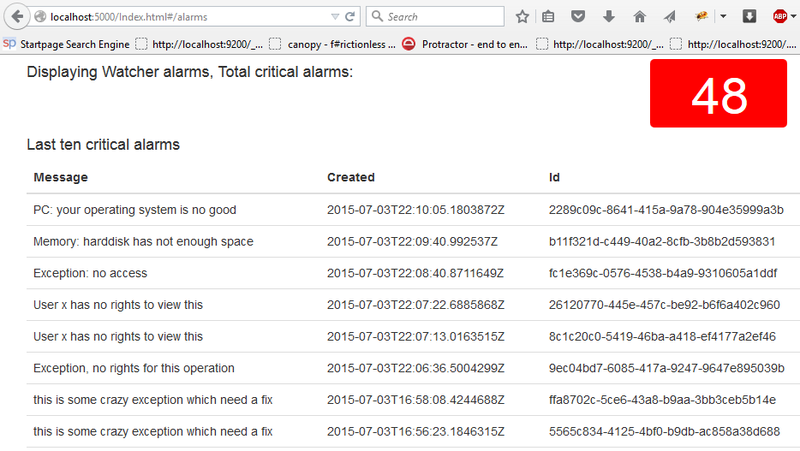 When Elasticsearch sends new data, the _alarmsHub is used to send the total count of critical data to the SignalR clients and also the last ten critical alarms. The SignalR events are implemented in Angular using angular-signalr-hub. This is not necessary but I like its simplicity when using it. The SignalR packages are added using bower. These are added to the bower.json file in the dependencies property. This will download and install the default bower settings. If you required only the min files, then you need to customize the exportsOverride for the packages. Now the module can be added to your main angular module and also the new alarmsDisplay route can be configured in the app.js file. The application uses an angular controller to add the SignalR client to the UI. This is implemented in the AlarmsDisplayController controller. The SignalR client implements two listeners for the SignalR methods. When the listeners receive an event, the data is added to the root scope of the application. Once the controller is completed, the data can be used in the alarms display HTML file in the templates folder in the wwwroot. This HTML will be updated every time a SignalR event is sent to all the listening clients. Every time a new critical alarm is added or created, the alarm is saved to Elasticsearch and within 10s, Elasticsearch Watcher notices this and calls the MVC 6 action method. The action method then uses SignalR and the UI is updated in real time. The HTML page is updated is real time without a refresh using SignalR. Using Elasticsearch Watcher together with SignalR and ASP.NET 5, some really cool features can be implemented which could be very useful when solving a business problem for a particular use case. At present the application uses HttpClient directly with Elasticsearch to create and delete the Elasticsearch Watcher, with a not so nice magic string. This will be updated as soon as the next NEST Elasticsearch Watcher is released and supports the watcher features used in this application. I can’t seem to find the package “Microsoft.AspNet.SignalR.Server”: “3.0.0-beta7” , the only one returned to me is the “3.0.0-beta5” which doesn’t seem to work in my code. I use 3.0.0-beta8-15595, sorry I’ll update the packages, thanks for the feedback, beta8 should be released today, I’ll update the whole project then. Can you confirm that SignalR 3.0.0-beta8-15595 properly works on ASP 5 RC1 waiting for the latest and greatest SignalR 3 ? Else would it still be possible using SignalR 2 with ASP 5 RC1 ? I would not use any ASP.NET Core until RC2 is released.